We invite you to preview highlights from Volume 100, Number 2 (Spring 2014) of the Catholic Historical Review. On this page you can browse abstracts and excerpts from articles and reviews appearing in the Catholic Historical Review. 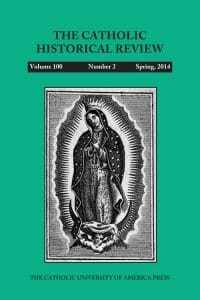 Abstract: Histories of women religious in the United States no longer follow a pattern that extols Superior Generals and presidents while ignoring the collective work of the congregation. In her presidential address to the American Catholic Historical Association, the author offers a reminder that despite this shift in historical research, we still have much to learn about the most well-known American sisters. Focusing on Elizabeth Ann Bayley Seton, Theodore Guérin, and Katharine Drexel—all of whom have been canonized—she examines their relationships with bishops, both collegial and adversarial, as a way to further understanding about the place of women religious in U.S. Catholic history. Abstract: In the years before World War I, French Catholic women played a critical role in facilitating cooperation among Catholic women globally to solve problems such as poverty, class conflict, and religious disaffection. French Catholic women created international religious organizations and developed correspondence networks among Catholic women throughout the world. French Catholic women’s international programs allowed the French Catholic community to demonstrate its vitality at a time when religion seemed threatened by secularism. International faith-based engagement also opened up leadership opportunities for Catholic women, and it promoted women’s equality in the political and religious realms. Excerpt: In 1996, Mark Noll (whom author Timothy George counts as a friend, p. 257) published The Scandal of the Evangelical Mind, in which he argued that the problem with the evangelical mind was that not many evangelicals used it. George’s book is in some ways a corollary or echo to that 1996 book. The evangelical problem that George seeks to overcome is twofold. On the one hand there is the scandal of the modern—the superiority of contemporary life to premodern life. In evangelical circles this can be seen in a rejection of much of “traditional” church services in favor of “contemporary” or “praise services,” and in a rejection of Tradition more generally. On the other hand, there is a thread of evangelicalism that asserts that all one needs to interpret properly scripture is the text itself. This book is thus somewhat of an apology, written by an evangelical to evangelicals, for the value—indeed, the necessity—of reading scripture with the Reformers. It was, according to George, in the Reformation that scripture was returned to its proper place at the center of Christian life—“The Protestant Reformation was a revolution in the original scientific sense of that: the return of a body in orbit to its original position” (p. 17f). Following an introductory chapter on the difference between the ways in which the Reformers read the bible and the modern historical-critical method are seven chapters that retell the history of the Reformation from the perspective of the centrality of the Word of God to the Reformers. George begins with the dawn of Renaissance humanism and the important work of Lorenzo Valla in critiquing, then criticizing, and finally improving upon the Vulgate of the fifteenth century. In the next chapter, George turns to Desiderius Erasmus’s discovery of Valla’s Collatio novi testamenti in 1504 that eventually set him on the path to the creation of his own revision of the Vulgate together with a Greek text published in 1516 as the Novum Instrumentum. This leads into a chapter on sixteenth-century bibles, the debates over revising the Vulgate, and the publication of vernacular bibles. Next, George considers the work of Martin Luther, the immediate followers of Luther, and then Zwingli and the emergence of the Reformed and Anabaptist voices of the Reformation. In each of these chapters the centrality and importance of scripture to the life and work of the reformers is lifted up. The final chapter turns to the question raised by the book’s title. This book is not a standalone work, but rather the first volume in a planned twenty-eight volume Reformation Commentary on Scripture set. For each book of the (Protestant) Bible, comments, exegesis, and insights from a wide variety of Protestant (and the occasional Roman Catholic) sixteenth-century writers will be compiled and presented. The aim, as explained in the final chapter, is to aid preaching. Fides ex auditu (faith comes through hearing), and thus the call of the Church is to proclaim God’s Word. George’s apology to evangelicals ends by asserting, “Our task is to point men and women both to the written Word in Scripture and the living Word in Jesus Christ” (p. 258). He believes that the Reformers still have much to offer those given this task. Excerpt: The sixteen essays in this volume originated in a 2007 symposium on medieval memory held at the International Medieval Society in Paris, but reach beyond France in their relevance to Western European medieval studies and the growing scholarly discourse on memory. The volume has a cohesive unity not always found in collections from conference origins, and together the essays present an understanding of memory that is both multivalent and wide reaching. Although individual contributors range in approach, they nearly all address “high” medieval culture in their examination of how memory and history are constructed. The elite focus is inevitable, given the surviving sources (which are drawn from a wide expanse of media and embrace both text and image), and in this case is far from a drawback; instead, the shared nature of the material provides a unifying note drawing these approaches together. The editors have organized the essays into five themes that emphasize specific aspects of memory and also highlight key concepts that weave through multiple sections. The sections are titled, respectively, “Memory and Images”; “Commemoration and Oblivion”; “Memory, Reading and Performance”; “Royal and Aristocratic Memory and Commemoration”; and “Remembering Medieval France.” Although the essays grouped under these headings work together to present aspects of each section topic, each of the section concepts also applies throughout the volume. The threat of oblivion (section 2), for example, is a note that sounds ominously, if softly, in nearly every essay, despite the paradoxical impossibility of deliberate forgetting. The dynamic interplay between individual and collective memory is one that also echoes through many of the contributions, as well as the crafting of specific memories for different target audiences, whether through liturgy, manuscripts, mosaics, or postmedieval community festivals. The creation of identity through memory is also a common motif, whether for individuals or communities, as constructions that also embrace gender, political boundaries, and social status. Contributing authors apply and expand on the foundational work of scholars such as Pierre Nora’s culturally potent lieux de mémoire, Frances Yates and Mary Carruthers on the concept of mnemonic tools, and Maurice Halbwachs’s concept of collective memory, to note a few of the most prominent. The cross-disciplinary combination of topics ranging from aural, visual, and textual examples makes the volume useful as a whole, rather than a compilation of parts. Although readers will no doubt gravitate toward specific chapter topics, the essays are well complemented by the application of differing disciplinary insights. Visual historians, for example, will find language imagery in saints’ liturgy and poetic acrostics, whereas textual scholars will be reminded of the power of marginalia, illuminations, and imaginative postmedieval reconstruction. The editors’ introduction provides a helpful sketch of recent scholarship for orientation. There is no summative bibliography, but the index includes references to major scholars, and Ashgate’s practice of including on-page footnotes assists the interested reader to pursue sources cited and parallel lines of inquiry. In conclusion, this is a well-organized volume with thoughtful essays that will prove of interest for scholars of medieval memory, both seasoned and new.